Six-month-old Panda arrived at the BC SPCA Prince Rupert Branch in desperate need of medical attention, vomiting violently and unable to eat. During surgery, it was discovered that the tiny black-and-white kitten has a string wrapped around the back of his tongue and all through his intestines. That didn’t dampen the spunky feline’s spirits, though. 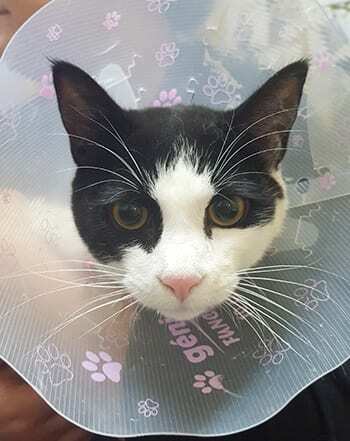 With the help of the community, the Prince Rupert Branch hope to raise more than $1,500 toward Panda’s care, which includes the cost of antibiotics, vaccinations and being neutered. He will be up for adoption after he fully recovers, which is estimated to take about a month. A non-profit organization, the BC SPCA relies primarily on public donations to help the province’s most vulnerable animals. Panda’s case highlights why pet parents have to be vigilant of what their fur babies have access to, especially around younger animals, Morris notes. If you can help Panda or other animals like him in need at the Prince Rupert BC SPCA Branch, visit spca.bc.ca/medicalemergency or drop off donations in person at 1740 Prince Rupert Blvd., B.C.